I had a great conversation with a former manager and mentor yesterday on the topic of granting trust. In these conversations, I think about trust as having the components of character and competency. Trust is also the cornerstone of relationships. Relationships are what make up a culture, including a company’s culture. This talk led to a conceptual model that I have in my head. This model is compromised of four overlapping circles. 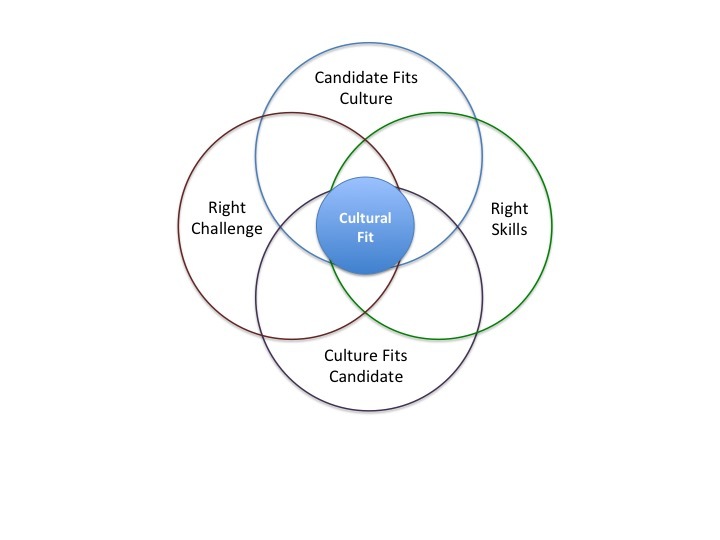 When the conditions of each circle are met, the Venn tells you that you have a cultural fit. After this conversation, my Travelabulous co-founder, Masha, was with me and dropped the classic line, “We should write that up, and when I say we, I mean you.” Well, if I am going to write it up anyway, I might as well turn it into a blog post. It doesn’t matter what they are as long as they are clearly articulated and aligned to your fundamental belief system. So, your candidate is going to be a great fit on the team. The next important question is one of competence. Is this person going to bring the necessary and missing skills to the team. It is easy to cut someone slack if you love them and they seem to be a great fit. However, if the person cannot carry his weight, he won’t fit the culture for long. Make sure the person has the right skills that you need. You notice that I don’t use knowledge here. At least in the case of travelabulous, we firmly believe in having a learning culture. Skills can build knowledge, but rarely does that work in reverse. The question for the candidate is, “Is this opportunity going to bring the right challenge for me.” This is personal. The candidate might want to stretch herself, but likely no one wants to show up feeling like she can’t get the job done. This will also ruin cultural fit as well. Assuming the other circles are all positive, the candidate now has to decide if the challenge is sufficient. That is, not too hard, but interesting enough to jump out of bed every morning to get at it. Well, there it is. I suggest creating this chart for every new candidate. Get your team to weigh in. Make sure the candidate fills out two of the circles for herself. ’til next time… Kirk, out. ← When is it Time to Start a Startup?